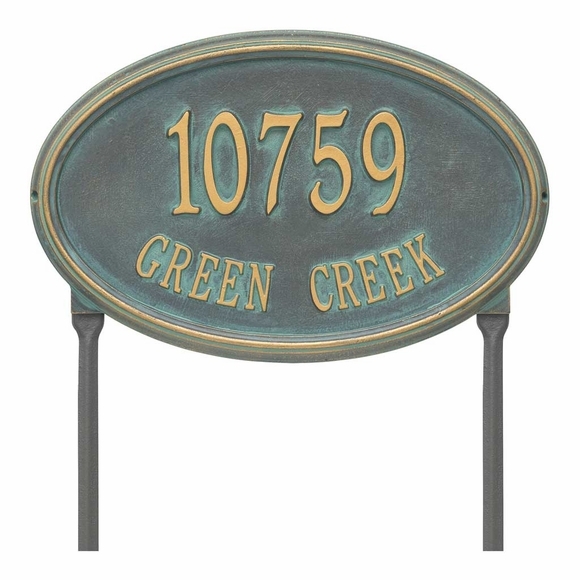 Concord Oval Address Plaque - - personalized oval address sign displays your address number and street name. Wall mount or lawn mount with purchase of optional lawn stakes. Estate size 20.5"W x 13.25"H. Made in USA. Classic oval design with raised border that accentuates the shape. Line 1 holds up to five (5) 4" numbers. Large image shown with optional lawn stakes in bronze/verdigris. Smaller images (from left to right): antique copper, black/gold, black/silver, bronze/verdigris, oil rubbed bronze, and bronze/gold. Concord Oval Address Number Plaque personalized oval address sign. Made in USA.